Nestled in a stunning hillside location just a short distance from the sandy beach this glorious Ko Samui villa in Chaweng is a true tropical retreat. Peace pervades in this multi-level home which offers smart contemporary living, excellent amenities and stunning views. Situated within an exclusive hillside community this secure and spacious property offers four glorious bedrooms, an impressive sun deck with an oversize pool, multiple living areas and so much more. From every aspect guests can enjoy views over the palm-clad hillside and the glittering Gulf of Thailand, with an array of other attractions nearby. An inviting outdoor staircase leads up to the first floor sun terrace and infinity edge lap pool. The terrace is home to a delightful alfresco dining area, BBQ, luxury sun loungers and attractive poolside ornaments, with a child’s paddling area to the near end of the pool. A shaded area is home to a table tennis table and open air shower, providing an ideal space to cool off from the hot Samui sunshine. The pool deck spans out over gardens fringed with exotic flora and fauna. Floor to ceiling doors fold open into the expansive living room, with multiple areas to sit and relax. The room is adorned with modern furnishings, tasteful art works and accessories, smooth white floors and state-of-the-art entertainment system as well as an office alcove and library. The opposite end features a western style kitchen next to the dining area with seating for 6-8 guests. Adjacent sliding doors allow daylight to flood in, with views over pool deck and the blue horizon beyond. The four en-suite bathrooms boast modern fixtures, terrazzo walls, large basins and granite units with oversize walk-in rain showers. A fifth guest bathroom is located in the kitchen/dining area. 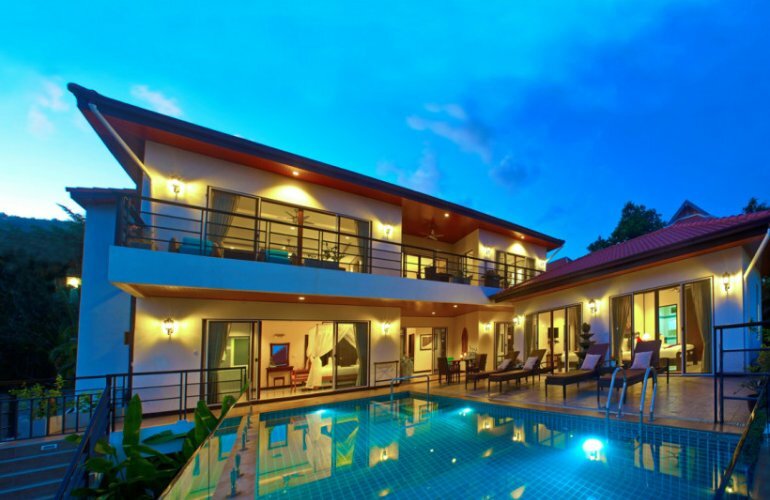 This charming luxury villa is ideally located in South Chaweng with easy access to the sandy beach and clear blue sea. This popular vacation spot boasts an array of attractions and amenities including shops, restaurants, bars, sporting activities and cultural sights. The airport is just a short drive away, as is the famed Fisherman’s Village with views across to Koh Phangan and regular boat trips to nearby islands. This luxury vacation home in Chaweng allows you to easily combine plenty of fun in the sun with ultimate rest and relaxation.